Saves your Time, Planet and Money. Get a Great Work-Out in your car or truck as you are STUCK in traffic. Moves your car down the road at 5 to 10 MPH, the flow of traffic jams we all face every day. Could prevent 50 million tons of Greenhouse gases going into the atmosphere every year from this country alone. 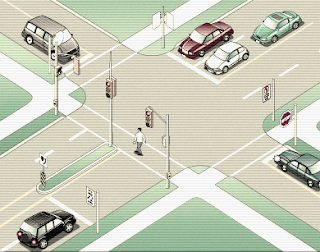 The Auto-Gym Saves Gasoline, Greenhouse Gases and gets you to work on time. 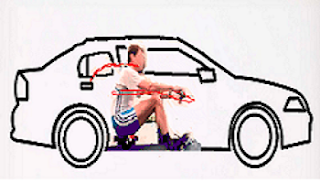 New Invention - The Auto-Gym enhances gasoline and electric powered cars with Human Power! We will USE these FUNDS to CREATE A PROTO-TYPE exercise machine that powers your vehicle down the road while the engine is turned off - saving gas, time and the Planet! Almost everyone who has a job to commute to has been in one of these. SOME OF US DAILY! Most of us have to put up with moving along at a SNAIL’S PACE for miles, which adds a great deal of stress in our lives. Stress is the cause of most of our most serious ailments. BUT, if you have to go through it - why not Exercise your way along the route? Cuts stress - cuts gasoline waste and cuts down on the greenhouse gases your engine is pouring into the atmosphere.. While your engine is running, it's burning gasoline, helping to pollute the planet, fills your own lungs with toxic POISON GASES, and at the same time, wastes your money. Some of you spend ONE HOUR - TWO HOURS and EVEN SOME OF YOU SPENDING THREE HOURS PER DAY EVERY DAY - WATCHING THE BEST TIME OF YOUR LIFE TICK AWAY. WHAT AN INCREDIBLE WASTE OF YOUR TIME~! Even if you DO NOT use Freeways in your daily travel, you will on average spend 20 to 30 minutes PER DAY sitting at Traffic Lights and waiting for Pedestrians, etc. WHAT AN INCREDIBLE DOUBLE-WASTE OF YOUR TIME~! YOUR PEDAL POWER CAN ACTUALLY MOVE YOUR CAR SLOWLY DOWN THE ROAD - WHY NOT? You're MOVING ALONG AT ABOUT 5 Miles Per Hour - YOUR LEGS and/or YOUR ARMS can do a much better job of moving you along at that pace. All we do is CONNECT this Pedal Exercise Machine to YOUR CAR OR TRUCK’S DRIVE TRAIN or AXLE. ANNOUNCING - HPA's or Human Power Assisted Vehicles. 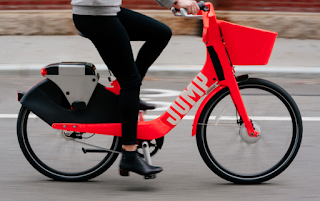 You've seen the HPA BIKES - from JUMP all over town at least if you live in California. These are HUMAN POWER ASSIST VEHICLES with Electric Motors and Batteries as the MAIN Power Train. BUT what IF we INSTALLED this SAME TECHNOLOGY INTO OUR CARS and LIGHT TRUCKS? WHY NOT ROW YOUR WAY DOWN THE FREEWAY? 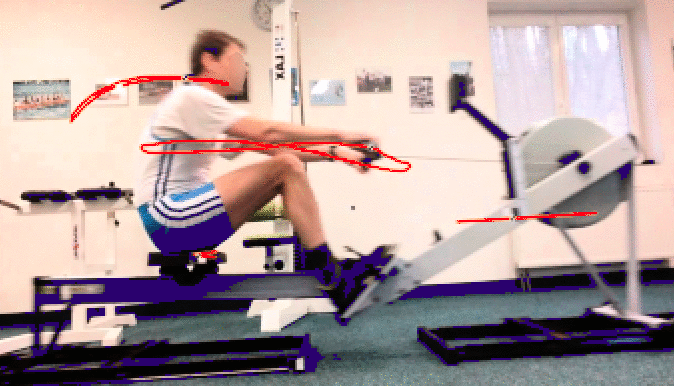 Your Rowing Work-Out in the gym is NOT getting you anywhere - NOW it can TAKE YOU HOME or To WORK or Play. Wherever there is a ROAD - There will be an AUTO-GYM~! LET'S ALL GET FIT and HELP SAVE THE PLANET AT THE SAME TIME. WHEN AUTONOMOUS (Self-Driving) Vehicles hit the road in the next couple years - A GYM in your CAR will make so much more sense because you will have NOTHING BETTER TO DO. 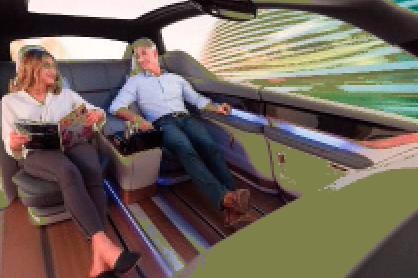 LIKE IT OR NOT - THIS IS OUR DRIVING FUTURE - NOT ONLY will it cut down to nearly zero the number of fatal accidents on our highways and biways, but it will also MAKE US ALL MORE HEALTHY - So much so - that you may not even NEED HEALTH INSURANCE. In my life - Exercise is what has prevented all kinds of diseases from overwhelming me. Exercise is the BEST and CHEAPEST FORM OF HEALTH INSURANCE that THERE IS - TRUST ME. YOU MAY NEVER NEED HEALTH INSURANCE - BECAUSE YOU WILL GET HEALTHIER AND NOT REQUIRE HEALTH CARE NEARLY AS MUCH AS YOU MIGHT HAVE WITHOUT THE AUTO-GYM - WHAT'S WRONG WITH THAT? At TWO and THREE Miles Per Hour that the traffic gives you for hours every day, this amounts to about 2,000 to 4,000 CALORIES BURNED On your way to WORK - or on YOUR WAY HOME. You arrive at your destination RENEWED and REFRESHED instead of STRESSED and ANXIOUS and deflated. PLUS Save On Gym Membership FEES! BUT YOU SAY! "My car is so heavy - how could one little person like me move two tons even a few inches? YES - HE'S POOPED but . . This guy got his vehicle to almost 90 MILES PER HOUR. But you'll never need to go more than 2 to 5 Miles Per Hour in HEAVY TRAFFIC - and ANYONE CAN DO THIS. This project, and others like it, have given us the Physics Data to make the following claims. When your vehicle as attained a highway speed of say 50 to 60 miles per hour, because of special gearing ratios of 40:1 or even 50:1 - the average person can use their leg power to keep the car at this speed on a level surface for a limited time. Therefore, over time, you will find yourself getting stronger and stronger and being able to achieve speeds by pedal and/or rowing power alone using our Auto-Gym and therefore, using your engine or electric motor less and less as you get 'In Freeway Shape'. Some of you may never challenge yourselves to get this strong and that's OK. You may, instead CHALLENGE YOURSELVES to get your car or truck all the way to 20 or maybe even 30 Miles Per Hour - and MAINTAIN that speed for longer and longer periods prompting the most fit of you to make your next car an ALL ELECTRIC VEHICLE because with the AUTO-GYM installed, you'll never have to WORRY ABOUT RUNNING OUT OF BATTERY POWER. Because your own HUMAN POWER IS ALWAYS THERE READY TO BE TAPPED - and most of you will always be able to pedal your car down the road or row your car down the road up to the next off-ramp, or even the rest of the few miles to your home or office where you can RECHARGE BATTERIES. This constant challenging of the fitness of the commuting public could eventually lead to HUMAN POWERED VEHICLE LANES along the freeways and roads of your community, which could then trigger a total revolution in the design of our global transportation systems so that we never have to use fossil fuels for transportation ever again. This is the kind of cycle we want to encourage - not discourage. 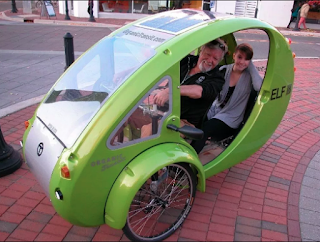 WHEN used with a Battery and Motor to ASSIST the pedaler - you can go ALMOST ANYWHERE IN THIS THING. Over the coming days and months - We will be ASKING CONGRESS to pass a law REQUIRING ALL NEW CAR MANUFACTURERS SELLING CARS IN THIS COUNTRY to include the Auto-Gym as STANDARD EQUIPMENT in at least 50% of their new cars. Reduces the weight of the car or truck. Utilizes more battery power than gas-engine power. Make people more healthy - thus save money on Health Care, gasoline, gym memberships. 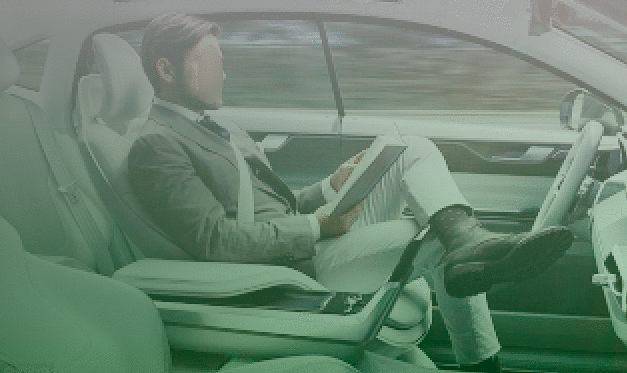 SO - IT ALSO MEANS that when Autonomous Cars are more common, probably in less time than you think, you will be able to work out even at higher speeds because the driving attention is turned over to computers with sensors that are far more reliable than the human brain which is more and more distracted today. WHY FIGHT IT? This IS THE FUTURE. In other words, these cars will become LESS-EXPENSIVE - NOT MORE costly by adding this feature that also SAVES GASOLINE - HELPS SAVE THE PLANET and most importantly SAVES YOUR HEALTH. Please ADD this URL to every one of your EMAILS so that millions of people can become familiar with this major new BREAKTHROUGH and a MAJOR PART Of the GREEN NEW DEAL. 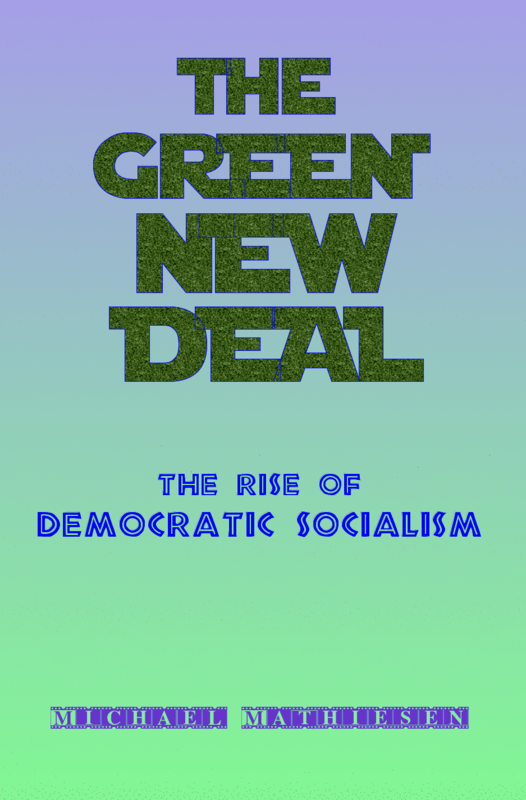 The inventor was INSPIRED and CHALLENGED by the PROVISIONS of the GREEN NEW DEAL and even wrote a book about it - FOUND HERE. Because what this RESOLUTION IN CONGRESS MEANS to do is get everyone up off their sofa and into the WORLD to VIEW it in a NEW WAY - asking ourselves - WHAT IS IT I CAN DO TO HELP SAVE MY PLANET? If everyone thinks this way - WE CAN MAKE IT- WE WILL MAKE IT. Humanity will survive the incredible and unprecedented challenge that we have created by living on FOSSIL FUELS. IF everyone in the United States drove one of these proposed Human Power Assisted Vehicles or The AUTO-GYM, we would prevent over 50 Million tons of Greenhouse gases getting into the atmosphere every year. IF the entire world adopted this new standard of Planet and Individual HEALTHY Mobility - we would save TEN TIMES MORE than that. This doesn't INCLUDE the millions of tons of Greenhouse gases required to discover, transport and make gasoline and diesel from the OIL reserves that could remain in the ground. This ALSO does NOT include the BILLIONS of DOLLARS SAVED in HEALTH CARE - Doctors, Hospitals, Insurance, Prescription Drugs, etc. BECAUSE EVERYONE would be TEN TIMES HEALTHIER from all of the exercise EVERY DAY. It's little-known fact that SITTING without exercise at one's desk OR IN YOUR CAR OR TRUCK for one hour is equivalent to SMOKING A PACK OF CIGARETTES in terms of Heart Health. OUR DEVICE can be made for Gas-Powered Cars, Hybrid Vehicles or completely Electric Vehicles. With electric vehicles you will have the option of generating MOTION down the road by putting your energy into your axles OR by sending it through a generator into your BATTERIES - NO MORE RANGE ANXIETY ever again. USE IT IN YOUR EMAILS - IG'S ETC. ABOVE ALL . . . SUBSCRIBE TO THIS BLOG TO GET UPDATES ABOUT WHEN, WHERE AND HOW you can get YOUR AUTO-GYM INSTALLED IN YOUR CAR OR SMALL TRUCK. WHY SHOULD YOU TO JOIN US? There's a YOUTUBE video of a TRUMP SUPPORTER outside of one of his recent rallies. A reporter asks her whether or not she agrees with the Green New Deal. Her Answer: "Who Cares? I'm not going to be around in 50 years!" So, the reporter asks her another question. DO you care about your children's future? THE EXPRESSION ON HER FACE IS PRICELESS. Sometimes, it takes a while for reality to sink in. I hope this helps.